Scott Heckman is returning to professional mixed martial arts action. The former Bellator MMA competitor and Cage Fury Fighting Championships champion announced his retirement last year, going out on top with a victory at X Fight 2 in June 2016. 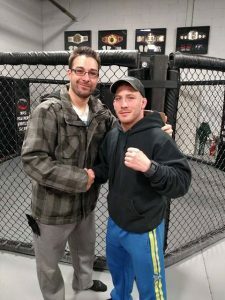 Heckman will return to the cage April 7 with newly organized promotion Maverick MMA. “Scott is a pioneer and legend in east coast MMA. He’s a multiple time champion and I’m so happy for him and his family that he is back doing what he loves. We were also able to get another local MMA legend in Steve McCabe. Steve has over 25 fights and has been in there with guys like Frankie Edgar. I’m excited and proud to have both guys headline our first show. Heckman’s professional career tallied 20 wins and eight losses. He will be taking on Steve McCabe (7-19), a Martinez BJJ prospect out of Philadelphia. “The reason why I retired from fighting was because it was not fun anymore for me. I was tired of all the politics that came with the sport. The hassles of contracts, and finding a decent opponent started to become more time consuming and draining then training for the actual fight. I also had a lot of personal issues going on in my life that didn’t allow me to mentally train the proper way I should have. So, I decided to take a step back completely and focus on my family. I was able to spend the time with my two children, Adrianna and Bently, and I was also able to give my wife the time and support she needs from me. The event will be held at the Sherman Theater in Stroudsburg, Pennsylvania. 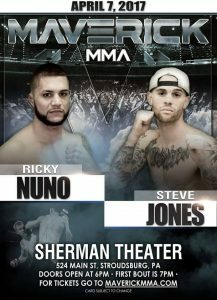 Also on the card, Steve Jones (1-2) takes on Ricky Nuno (2-4). Nuno has not competed in MMA since December 2014. The 31-year old fighter has not been sitting on the shelf however as he has competed in several boxing matches. Jones is coming off a December submission win over former WCC champion Mike Serrano. That was Jones’ first fight back in more than two years. “I’m pumped to see Ricky’s hands in his return to MMA after two years on the boxing circuit. Steve Jones is an exciting young fighter and will look to spoil Nuno’s return to the cage,” Sisca said.